This month, we are honoured to share an interview with our dear friends Jessica d'Abadie and Christina Symes, founders of We Are Triibe. A multi-platform design brand founded in 2013, reinventing the way you create your space; specialising in interior design, styling, furniture design and creative direction. The choices we make with our clothing make us feel more creative and comfortable within ourselves. The natural fabrics, muted colours and organic lines all play a part. How does fashion influence you? We love all elements of design and feel as though within this realm - whether it be fashion, art or interiors, they all share a connection and tend to influence each other. A majority of the work we do is with fashion clients, and we are always finding ways to blend their beliefs and processes into an interior space that truly reflects their brand essence. Sometimes it’s the mood that the brand evokes which we develop into the mood of the interior space, and sometimes it’s the fabrics and colour palettes. Often – it’s all of it together. Jessica wears our Javi Classic top and Elliot Pants in clay. “Our work is informed by elements of art, craftsmanship, sustainability, environmental psychology”. Tell us a bit more about this, and how you embrace interior design? We have core beliefs that drive the designs we create. We often look to art as a point of inspiration for our designs, through colour palettes, form and texture. Craftsmanship is always really important to us, as we believe that pieces should last a lifetime. We approach design with an attitude of ‘less is more’ opting for quality and craftsmanship above mass manufactured and less sentimental pieces. Sustainability drives a lot of our design as well as it’s something that has always been very important to us and is becoming even more so. Most of all, we aim to create spaces with a core focus on environmental psychology – creating homes and interior realms that make us feel happy just to be in them. What textures and colours do you enjoy having around your home? Both Christina and I really gravitate towards natural tones in our home. We love incorporating splashes of colour through art and homewares - things that can change with seasons and moods. But, for both of us, the base of our home is warm, layered with timbers, soft fabrics, art and objects and pieces which hold meaning. For both of us, we believe home is a place which should make you feel cozy and relaxed, the colours and textures we choose within our home tend to evoke these feelings. How would you describe the influences in your worlds that have contributed to making you the women you are today? I think I’ve become the woman I am today because of a lot of really special people who have influenced my life. My mum has always been a really big inspiration to me, she always taught me to work hard and supported me through many of the big decisions I made in life. She gave me the confidence to start our business and to fearlessly trust my instincts. I have learnt so much from my closest friends, and feel continuously in awe at every single one of them – including Tina, who is a dreamer, and who has taught me to dream more too. My husband Josh has taught me a calmness that before him didn’t really exist, and along with him, my brothers and my dad have always been some of the biggest supporters and taught me to have faith in myself. Starting a business forced me to grow a lot in a very short amount of time, having to become completely self-reliant was scary and I had to overcome a lot of fears and limiting beliefs. This also contributed in a large way to making me who I am today. I have been incredibly fortunate to be surrounded by the most inspiring women & men who constantly cheer each other on and lift each other up. They have a fire in their heart and the world in their hands - it has been amazing to watch some of my nearest and dearest flourish on their own ventures, which in turn keeps me striving to grow with them. 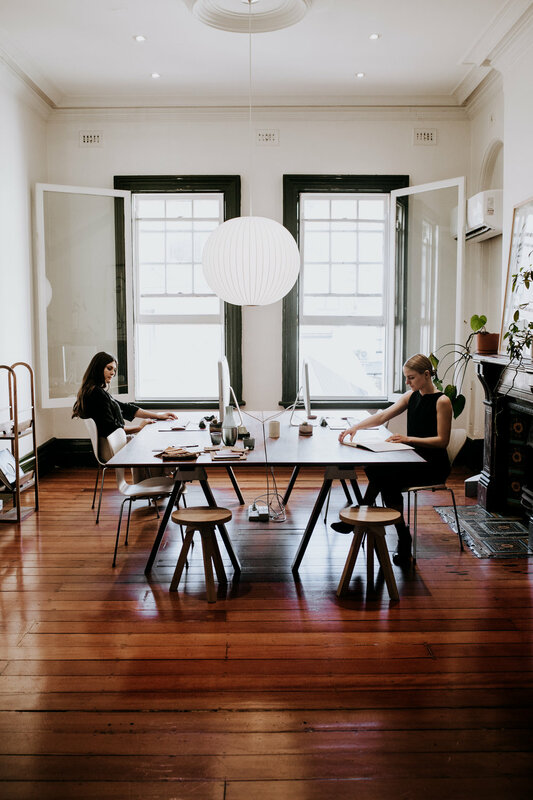 Triibe has based its new Concept Studio in Surry Hills, Sydney. Tell us about this and your favourite interior space in Sydney? When we got our first office we loved the space so much, and we loved the idea of collaborating with makers, artists and furniture suppliers to create a space together that we could work in, have people come in and visit, and inspire people with ways to create an office space that isn’t what they thought it should be. We wanted to create and inspire people through changing schemes and with that – being continuously inspired ourselves. We are currently in the process of changing our third concept studio, reinventing the space yet again feels so good – it’s like moving into a new home, and it’s a concept anyone can do in their own spaces. We want to show people how. My favourite interior space in Sydney is the art gallery of NSW. Aside from interior design, I also love to paint. So one of my favourite things to do when I’m feeling uninspired is to go there and just stare at the paintings. The building itself has so much charm with its old herringbone floors and arched ceilings. A restaurant in Paddington called 10 William, it’s simple yet refined and has such a welcoming environment every time I am there. Always best spent with good company. Melody wears our Charlotte Blouse and Elliot Pants in clay. We were lucky enough to meet this beautiful woman one year ago on Akazi's very first photo shoot. She made such a crazy time for us, relaxed and fun. We have loved watching her wonderful brand grow, and admire her talent and spirit. We are excited to interview Melody as the first in a series of AKAZI WOMEN. We travelled extensively as a young family - How did you find the experience of traveling with Zephyr? It was utterly incredible travelling with my little mate, it really was like that ~ a beautiful companion, he kept me in the moment, not usually thinking about what we will do tomorrow let alone today, we just went with it.. He was the best travelling companion I could have ever wished for.. There was no rest for me with him, ever! Not because I was with him all the time, but because he would never ever rest! We live predominantly outside here in Australia, he plays almost all day outside and so when we hit the city areas, it just wasn’t the same for me, not like just running free in the paddocks or riding bikes around, I had to be out and about with him all day in the dirty, bustling cities. On the city days in Paris, Barcelona, Florence & Naples, we basically just walked or biked for hours upon hours, over there everyone bikes and the rules are so much more relaxed, so Zephyr just sat on the back of the bike rack :) He loved it! When we weren’t in the city’s we were on beautiful farms doing work exchange in France, Italy & Spain.. Zephyr would spend the days helping me shovel horse poop, pull weeds, wash & feed animals and so much more!! Our whole Spain trip consisted of 2 weeks at the home of a wonderful lady and her 3 year old boy, she is so passionate about animals & has rescued so so many, so its her own sanctuary at her property and there was about 60 animals there. Doing these work exchanges with Zephyr was just incredible & such a learning experience for us both. Those were the absolute highlights of our trip, seeing how truly happy and in his element Zephyr was.. I feel he grew up quite a ton when we were away, things in him changed and his confidence and maturity blossomed.. I can’t wait to travel more with him. Can you share more about your upbringing? Do you think it lead you to such a creative career/ lifestyle choice? I had a very alternative up-bringing, both parents made a living off of creating crafts of all different kinds & doing the local markets with them. I suppose I didn’t really think of it as being alternative, it was just life.. But it wasn’t like it is now back 30 years ago, they were struggling artist hippies selling their wares to cover a holistic living.. However I am so grateful that I had a mum who spent her time with me rather than growing up in daycare because of ‘career, and getting ahead in life’... But the part that i can now see has had the most influence on me in regards to me ‘working in a creative industry & having my own business, is, well, I realise that having had these parents, they gifted me with a different way of thinking. I didn’t have any hesitation of creating my own business, and have worked only for myself since I was 21, and I’m now 32! I left school at 14 which was extremely young, but luckily I have always had plenty of drive and ambition and an open mind, I knew that I had to take myself where I wanted to go in life as no one else is going to get me there. I grew up living in the Byron shire so I was incredibly blessed with being surrounded by people with a special mindset and way about life, and yes for sure I have naturally carried this through to my adult years. Melody wears our Charlotte Blouse and Greta Wide Leg Pants . Do you practice any daily rituals? I wish i had more routine in my life, can I blame working for myself? I believe rhythm & routine is so needed for children and honestly makes the world of difference in so many ways, so he has a bit of a daily rhythm, my favourite part being bed time :) After dinner and a bucket bath, I read stories to him for about an hour in bed until he is super sleepy (At the moment its the original Faraway Tree or The Wishing chair, read already 150 times over) then I put on music till he is fast asleep (his favourites are Jimi Hendrix acoustic, Bob Marley & a couple of surf film soundtracks) I then snap out of my slumber state and get to work on the computer, usually from 8pm till midnight.. I try to work as much as I can while he sleeps so I don’t have to do as much work/Zephyr dance in the day hours. I really like to firstly choose clothing that is a natural fibre, thats a priority & I’m really into dressing so simply these days, simply yet I do love textures as well.. I love love feminine clothing and always have.. My perfect outfit would probably be a billowing Edwardian style sheer silk peasant top paired with some linen trousers & my Akazi ones (whats that style called!??) are perfect!! I would probably pair that with plaited hair and vintage leather sandals and a Zephyr boy my hand of course! So easy to get dressed and clothing that you can do anything in, I need clothing that can be transitional, to be able to work in the garden then go to the cafe haha.. I really can’t be bothered owning clothing that is ‘too special to wear’ so I just wear the hell out of everything that I love! And lastly, what are your plans for this year? For this year, I have no idea! In all honestly life is very ‘in the middle’ right now.. I don’t even have a vision for what I would like to happen.. Maybe right now is a time when I need to become more in the moment and not in the future, as usually I am always dreaming about what I want to improve in my life and where to next. So hopefully before I roll to the next chapter of my life I will learn to be here now, be here then! A K A Z I translates to Women in the Chichewa language of Malawi. Our labels philosophy is centered around simplistic timeless designs that tell a story, beautiful natural fabrics, comfort and attention to detail. We are a mother and daughter duo located on the Gold Coast, Australia who have combined our love of design to become the design and production team for akazi. We lived for eight years in a fairly remote area in the north of Malawi on a tea estate. My childhood was free and pretty wild at times and we took any chance to jump out of the schoolroom window to run around chasing monkeys. We had no shops for buying clothes and no internet or mobile phones but Mum always had her sewing machine and the local cloth was pretty good. All this lead to a creative, hands on approach to life and we feel this has influenced our choices with creating akazi. Mum and Dad returned to Australia after fourteen years in Africa and continued with their adventures creating a farm producing tea and lemon myrtle in the Northern Rivers of New South Wales. The transformation of the old bare dairy farm into a sub tropical rainforest was complete with the addition of the old Queenslander house brought down from Brisbane and many months of DIY renovations and tree planting. After I completed my degree in Melbourne and Mum was having a break from many years managing Disability Services we starting thinking that we would love to create something together. Something that would benefit form both our talents and that we could be proud of......and Akazi was born. Our dream is to create beautiful, ethically produced clothing which will make you feel happy inside and out. Clothing that is kind to our Earth. Thoughtfully designed and made from quality, natural plant based fabrics that age with grace. We aim to create a functional, minimal wardrobe that can be mixed, layered and treasured for years to come. Discouraging the throwaway 'fast fashion' industry. We want to encourage our customers to think about our clothing and their long-term use by connecting with them emotionally. To value the relationship they develop with the clothes over time - for each garment to develop it's own story. We care about our world, the environment and the people who inhabit it and will endeavor to take the more responsible path to reach our goals.